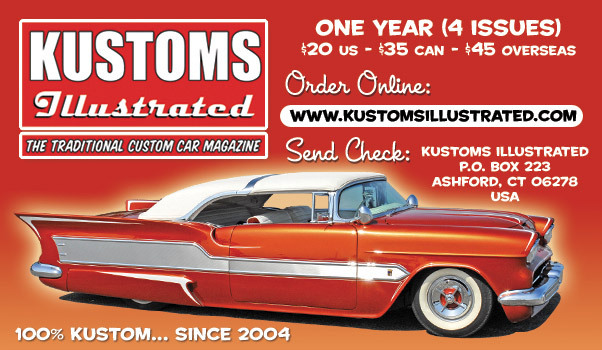 We have all read about the deep organic and scintillating Metallic Colors used by the customizers in the early 1950’s. But how did these colors really look like? 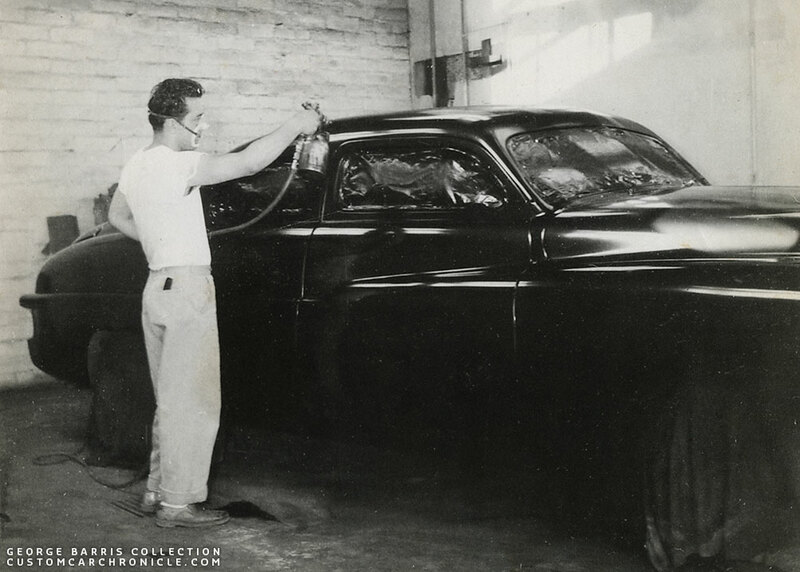 In late 2015 Thom Metz shared some great information and photos with us about the Sam Climo 1949 Ford first created in 1953. The Sam Climo Ford, still Climo family owned, was going to be displayed at the 2016 Detroit Autorama show in held in February. The car was going to be displayed with a wide selection of memorabilia from when the car was build and showed in the 1950’s. Thom also mentioned that the car was originally painted Moonglow Copper in 1953. And that this copper paint was bought from the Barris shop in late 1952, or early 1953. The car was repainted black in 1955, but the dash and the original fender skirts still remained the Barris Moonglow Copper paint. Sam never really cared much for the black paint and in the mid 1960’s the car was repainted in a color closely matching the original copper color. One of the Memorabilia items Thom came across when he was searching for items to use for the Autorama display, was the original paint chip sample Sam Climo had from the Barris Shop. 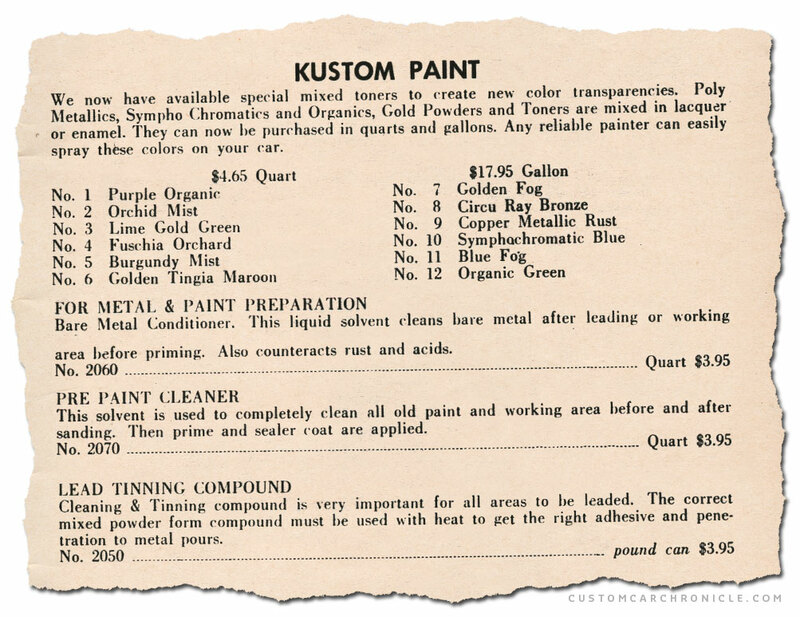 It was this paint chip card from 1952 that Sam used to choose the Barris/Nason paint color from. 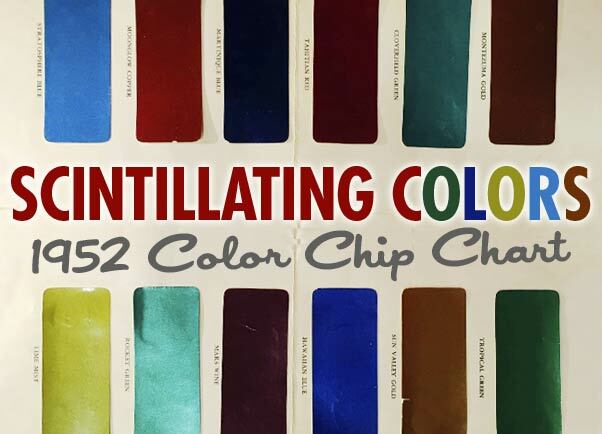 Totally amazing real lacquer colors, with names we have all seen in the black and white magazine features from the early 1950’s. The 1952 Nason Scintillating Metallic Color paint chop card has always been hidden for sunlight, so the colors are still very much the way there were when first applied in 1952. The R. N. Nason & Co. has long been recognized as one of the most prominent manufadters of the finest and latest in Automotive Paints. Leaders in the fiels, Nason’s Synthetic Enamels, (Glyko) and Lacquer (Auto Nitro-Lac) are widely acclaimed for their beauty and exceptional duability. Shown above are the newest and most colorful array of automotive paints. “SCINTILLATING METALLIC COLORS” The streamlined modern car of today, the result of man’s skill and progressive ingenuity, we feel is worthy of the finest in Automotive Paints. These “Miracles in Metallics” have been tested in the field as well as in the laboratory and are proven for durability/ Standardize on the Twele Scintillating Metallic Colors for satisfied customers. Nason manufactores a wide range of Primer-Surfacers, Thinners and specialized car finishes to meet the Automotive Paint Shop’s requirements. 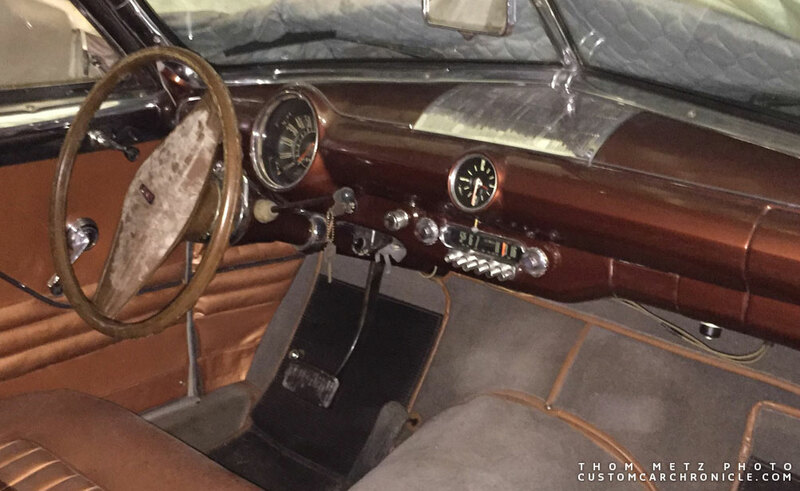 The dash in the Sam Climo 1949 Ford is still painted with the original Moonglow Copperpaint ordered from the barris shop in 1952-53. In late 1953 the Barris Shop started to sell products thru its new mail order business named Hollywood Kustom Accessories. In December 1953 the first ads appeared in which you could order the all new catalog. In a later version of this catalog there are 12 special mixed toners listed you could order. 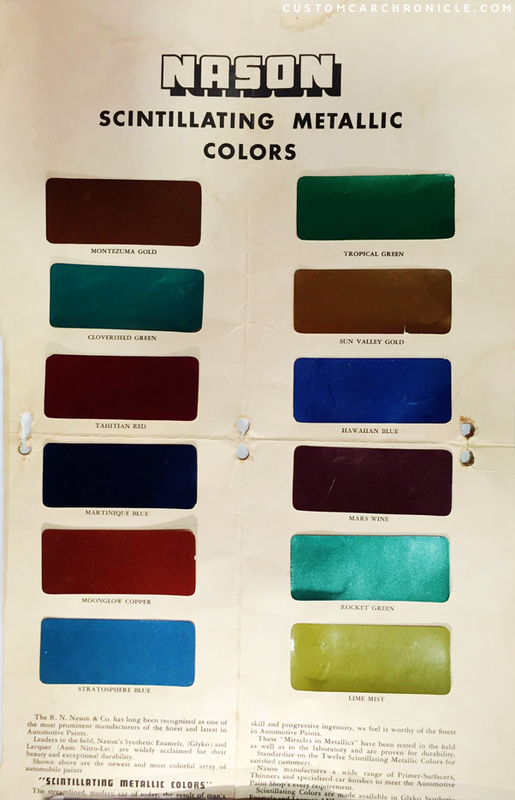 Most likely these colors were specially ordered by Barris after they had good success offering the Scintillating Metallic colors from Nason for a year or so. The Barris Hollywood Kustom Accessories catalog, first published in late 1953 lists similar custom colors. Although the color now have different names, and are possibly mixed according to Barris specifications. There are not to many photos from the early 1950’s of the masters painting cars in the brilliant, deep organic colors. Here George Barris applied a dark red on the chopped 4-door 1950 Mercury of Jerry Reichman. 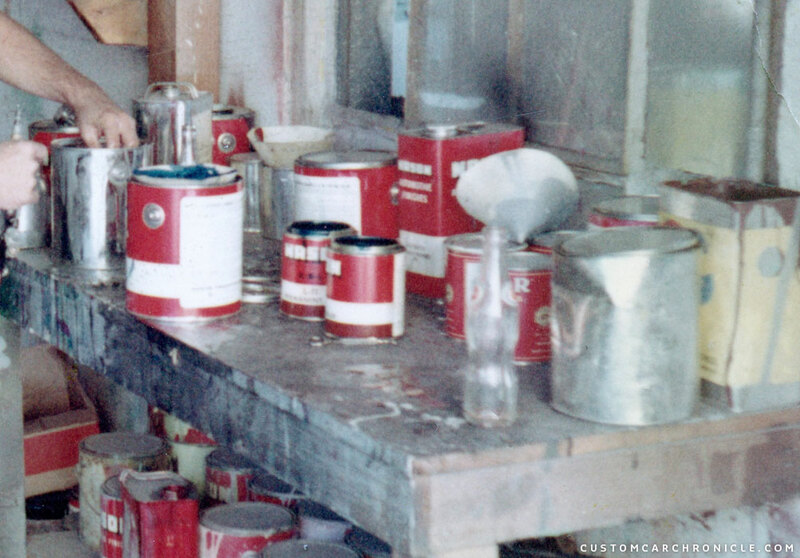 Larry Watson also used Nason paints in the late 1950. Another home run, Rik. Where else but the CCC can we find this history we thought lost in Time. Symphochromatics, Mists, Organics! Now we can see the colors we could only imagine in pouring over the “little pages”. Thom Metz, thanks to you for saving this rare memorabilia and sharing with us minions of the CCC. Wow awesome article Rik. Boy would it ever be cool to take that chart to a paint store and have them match all those colours. More terrific info. Rik! Those colours truly “pop” compared to the shades we remember on the factory production cars of the day! Interesting to me too is the reference to “Tahitian Red” as I recall reading and wondering if that, or, “Titian Red” were one and the same, typos, or…? Thanks Rik and Thom and Mr. Climo for preserving these things for us! Titian Red was a different, later color. I agree that to have someone scan and make formulas for these colors would be fantastic! Yes, Titian Red was a 1953 Buick color, and often used in our neck of the woods to imitate what we thought “candy apple” must look like. Buick also in that period had a light metallic lime green that was distinctive. 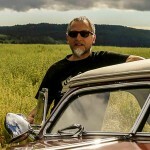 Great article on yet another Under investiagted segment of this art form. I still use Nason Paint today as that is what is on the Firewall of my custom. Wow…haven’t seen that color chart since the early 60’s. Used to use Nason paints and especially their toners. I’ve mentioned for years that Nason had the “cleanest” toners. Have to agree with Memo Ortega, they were more translucent. Used their L-90 toner that made a great candy red. Once everyone switched to acrylic lacquer I don’t know if Nason continued with their Scintillating Metallic Colors. I used their “Hawaiian Blue” on more than a few custom paint jobs then. What was great about that color was that when you went to order it, you could get it with a red cast, purple cast or green cast. Same Hawaiian Blue but looked different in the sun with slight highlight color shifts. Looked great. Those Scintillating Colors could be bought at any Auto Paint Store that sold Nason Paints in Pints, Quarts or Gallons. Always matched. Great colors. Too kool.